Again, keeping it all in perspective, for the amount of travel I do and the fact that we landed right side up, there isn’t much to complain about. Yet (or in other words BUT), a 6.5 hour delay is feels ridiculous excessive, especially up when you factor in the weather was clear (not just in Denver; essentially the entire country and airports were trending on time per flightstats.com) and virtually every other flight (and there were hundreds) was on time. Lets just rub salt in the wound, shall we? Granted, I got to the airport sooner than I needed. But you never know with traffic (40ish mile drive), getting gas at the one gas station by the airport (which, if you haven’t been to DIA, is out in BFE), returning the car, getting on the shuttle, checking I. Your bag, going through security, getting in the train and the possibility that your gate could be the furtherest away…. You should allow sufficient time. Lord knows, I ended up with enough time to drive home (not really but it felt THAT long. Of course, traffic was light, gas station not busy (that is unusual), returning the car was easy peasy and with curbside checkin (that I didn’t know existed) and TSA Pre Check, bada bing, bada bang… I was headed up the escalator at Terminal B in no time flat. Plenty of tome to walk to (gasp) Starbucks and all the way back to the west side United Club. I had just under two hours to burn. This was okay because as per the norm, I had a long list of stuff to do. After circling the drain club, I gave up finding a window seat with an outlet (outlets are a commodity at this particular club) I settled in my chair and powered up my laptop. When I went to grab some water, I happened to notice the words “delayed” and my heart sank before I even looked to see the flight’s destination. Oh please, please, please don’t let it be mine. Balls, it was mine, really? Hundreds of flights and really, literally the one and only delayed flight? What are the chances? Well, now that you’ve asked, pretty darn good if you’re me. The reason: crew delay. 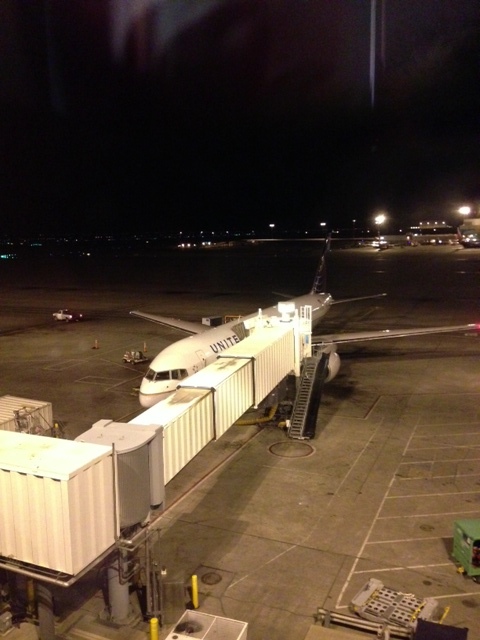 I already knew our plane was at the gate… I was just above where it waited for its next passengers. So it was slated to be an hour late. This always makes me suspicious, because if I’m delayed it is almost always twice the time the first say (in other words, if its 30 it ends up 60) so I assumed two hours. This was not what I wanted to hear, but what can I do? I went back to work and sure enough, here comes the text saying 9 PM. Uh oh. Definitely another ominous sign of impending doom. Trying to remain positive, I continue used working talking on the phone about my plight. In the middle of a conversation, I hear an announcement at the club. “Ssshhh” I hissed into the phone (and I hate being ssshhhed but this was important) “for those of you on delayed flight…” Come to find out, our crew was still sitting in Chicago, a good 2.5 hours away once they are in the air. Quickly counting in my mind, I knew the 9 PM wasn’t realistic. In fact, when I pulled up the status of the Chicago inbound flight with my crew, I discovered it was a mechanical issue that has already been delaying that flight for 4 hours. YIKES! This is where I became frustrated. They were in Chicago so why not replace the darn plane and send them on their way? After all, it is United’s headquarters so it seemed logical that would be an option if a plane isn’t easily fixed. It took 5.5 hours but finally, someone figured out they should swap out the plane and we all cheered when it was announced it was in the air on its way to Denver. About !@#$%! time, I’d say. This put our departure somewhere close to midnight. Around 9:30 I really thought I wouldn’t make it. I was so tired (from lack of sleep the past couple of nights) and travel in general, I was convinced that I was going to die at DIA. Fortunately, a friend took pity on my plight and stayed up with me (she was in Chicago, ironically) and kept me sane company up until we departed. Then came the dilemna, do I sleep or do I enjoy the wonderful dinner provided in first class? I opted to stay awake but the meal was not worth it. Even the warm chocolate chip cookie was cool so there was little to enjoy other then the fact I was finally in the air and on my way home. 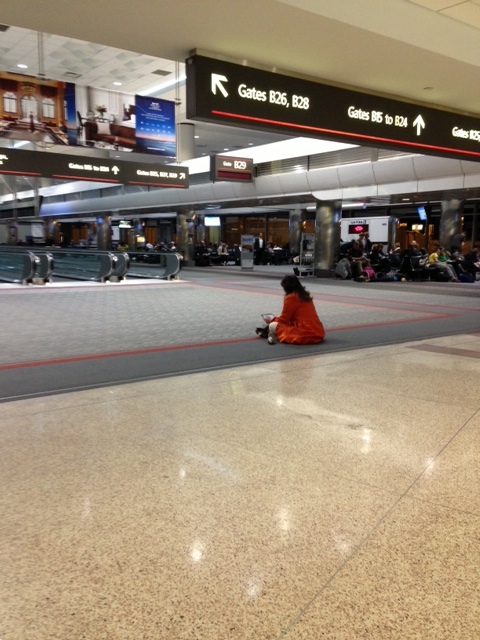 Ten hours after I arrived at DIA, I finally landed at PDX. The only fortunate thing was we were the only plane arriving at 2 AM so it didn’t take anytime to get my bag and head for my car. Only I didn’t remember which floor I parked it on. Oh, I thought I did. I got off on 4 and it wasn’t there. Crap. It must have been 5. Nope. Six? Not even close. Back down to level 3 and there it was. Well, that was fun. Killing an additional 10 minutes before heading home. Thanks for kicking me whilst I was down (again), Murphy. Why do you have to be such an a$$?! Fingers, toes, legs, arms, even my brain is crossed hoping travel to Florida is smooth this upcoming week. Surely it is my turn after the past two weeks. And I’m pretty sure all my co-workers who join my flight in Denver would appreciate it as well. Just remember, it is NOT my turn and I promise to keep my big mouth shut. 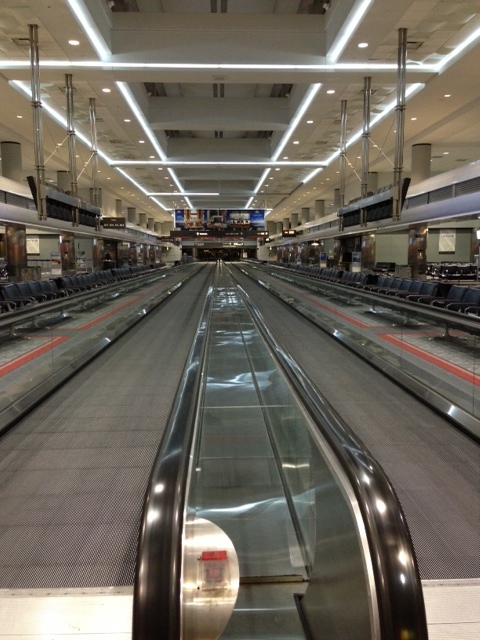 Terminal B at DIA. I’ve never it seen it so empty! 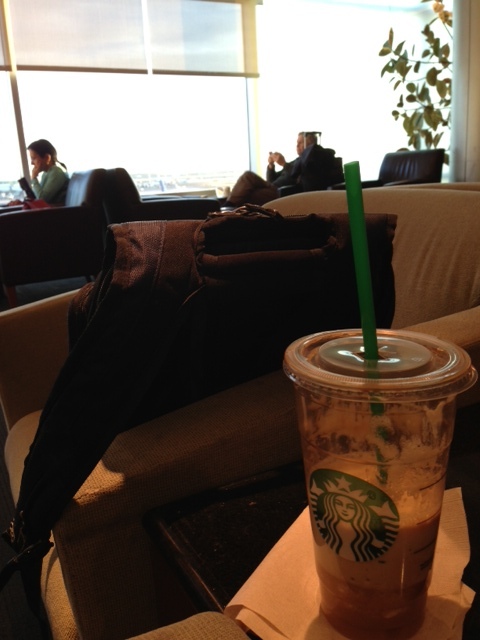 Enjoying Starbucks at the United Club before my evening took a dive. I think I’ll sit… here. In the middle. People are strange!